In paper, the property which causes it to take up liquids or vapors in contact with it. In optics, the partial suppression of light through a transparent or translucent material. Folding or feeding paper at right angles to the grain direction of the paper. A roll that gives non-uniform drawing across the web. There are slack and tight sections across the width of the sheet. The variability among living organisms from all sources including, inter alia, terrestrial, marine and other aquatic ecosystems and the ecological complexes of which they are a part; this includes diversity within species, between species and of ecosystems. Blisters are small, bubble-like formations which appear on both sides of the web in exactly the same area, primarily in areas of heavy ink coverage. Excessive moisture cannot escape because the ink coverage traps it. The degree of thickness of paper. 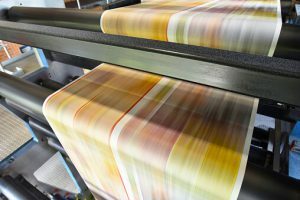 In book printing, the number of pages per inch for a given basis weight. Short irregular ruptures of the web in the cross-machine direction. This defect occurs at regular intervals but usually does not extend to the edge of the web. A complete rupture of the web in the machine direction. Defect is sometimes visible at the edge of the roll appearing as a stickout, but many times is hidden inside the roll and is not discovered until the roll is unwound. Calender cuts have a glazed edge and are straight, sharp cuts running for a relatively short distance at an angle to the direction of the web travel. The channel through which products are distributed from their origin in the forest to their end-use. A coating streak will show up as an area of light coat-weight or as a broad indentation in the coating surface. The length may vary from a few feet to several hundred feet in the machine direction. The correct combination of black, cyan, magenta and yellow to (1) reproduce a photograph without color cast, (2) produce a neutral gray, or (3) reproduce the colors in the original scene or object. Any method such as masking, dot etching, re-etching and scanning, used to improve color rendition. A photographic image contains gradient tones from black to white. Any furnished material (typewritten manuscript, pictures, artwork, etc) to be used in the production of printing. Diagonal ridges and furrows running in the machine direction and of a relatively constant width which occur around the circumference of the roll. Ability to maintain size; resistance of paper or film to dimensional change with change in moisture content or relative humidity. In printing, a defect in which dots print larger than they should, causing darker tones or stronger colors. A measure of the resolution of a screen image or printed page. Spots per inch (spi) is a more appropriate term. In inkmaking, a term used to describe ink chemist’s method of roughly determining color shade. A small glob of ink is placed on paper and drawn down with the edge of a putty knife spatula to get a thin film of ink. A community of all plants and animals and their physical environment, functioning together as an interdependent unit. A short, straight cut located on the edge of the web, caused by a fiber imbedded in the web of the paper. The composition, dynamics, functions and structural attributes of a natural forest. a clearly defined forest area with mapped boundaries, managed by a single managerial body to a set of explicit objectives which are expressed in a self-contained multi-year management plan. forest management which, in conformity with the FSC Principles and Criteria for Forest Stewardship, is environmentally responsible, socially beneficial, and economically viable. A hair cut is a short, smooth curved cut having no definite length or direction, which is caused by hair, or some synthetic fiber getting into the paper. The reproduction of continuous tone images, through a screening process, which converts the image into dots of various sizes and equal spacing between centers (AM screening), or dots of equal size with variable spacing between them (FM screening). High Conservation Value Forests are those that possess one or more of the following attributes: a) forest areas containing globally, regionally or nationally significant : concentrations of biodiversity values (e.g. endemism, endangered species, refugia); and/or large landscape level forests, contained within, or containing the management unit, where viable populations of most if not all naturally occurring species exist in natural patterns of distribution and abundance b) forest areas that are in or contain rare, threatened or endangered ecosystems c) forest areas that provide basic services of nature in critical situations (e.g. watershed protection, erosion control) d) forest areas fundamental to meeting basic needs of local communities (e.g. subsistence, health) and/or critical to local communities’ traditional cultural identity (areas of cultural, ecological, economic or religious significance identified in cooperation with such local communities). 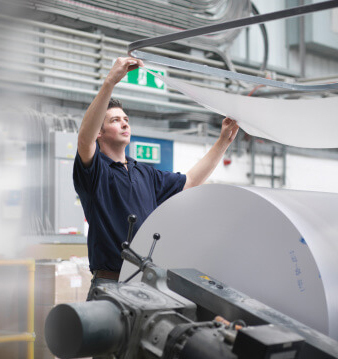 In printing, a property of coated paper with low ink absorption which allows ink to set on the surface with high gloss. Papers with too much holdout cause problems with setoff. The total environment of the lands, air, water, sea, sea-ice, flora and fauna, and other resources which indigenous peoples have traditionally owned or otherwise occupied or used. The tonal range between highlights and shadows of a photograph or reproduction. A unit in which wavelengths of light and other radiant energy are expressed. One nanometer is one billionth of a meter. Forest areas where many of the principal characteristics and key elements of native ecosystems such as complexity, structure and diversity are present, as defined by FSC approved national and regional standards of forest management. That property of paper which minimizes the showthrough of printing from the back side or the next sheet. Material such as coating, fiber, or other surface contaminants is picked off of the sheet leaving a void in the printed image. Forest areas lacking most of the principal characteristics and key elements of native ecosystems as defined by FSC-approved national and regional standards of forest stewardship, which result from the human activities of either planting, sowing or intensive silvicultural treatments. A term describing the visual impression of a printed piece. In paper, the properties of the paper that affect its appearance and the quality of reproduction. 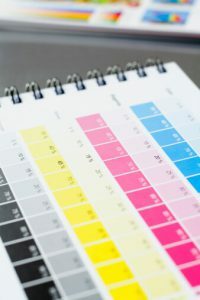 In printing, the subtractive primaries: yellow, magenta and cyan, plus black in fourâ€“color process printing. Printing from a series of two or more halftone plates to produce intermediate colors and shades. The primary additive colors used in display devices and scanners. Commonly used to refer to the color space, mixing system or monitor in color computer graphics. High or low caliper rings or bands around the circumference of a roll results in a permanent distortion (knuckle stretch) of the sheet. In binding, to fasten a booklet by wiring it through the middle fold of the sheets. To impress or indent a mark with a string or rule in the paper to make folding easier. In color reproduction, angles at which the halftone screens are placed with relation to one another, to avoid undesirable “moirè” patterns. A set of angles often used is: black 45. Magenta 75, yellow 90, cyan 105. To decrease in color strength, as when halftone dots become smaller; opposite of dot spread or dot gain. Visible printed image can be seen on the reverse side, or through other pages. Slime Holes are voids left in the sheet due to displacement of fibers at the wet end of the paper machine. a forest management unit which meets specific FSC requirements related to size and/or intensity of timber harvesting, and can therefore be evaluated by certification bodies using streamlined evaluation procedures. The edge of the roll appears fuzzy. There may be some loose fibers hanging from the edge of the roll. The even and consistant continuity of the papers surface. Breaks at or near a mill splice usually indicate some defect in the splice or a marked change in web tension or draw near the splice. Yellow, magenta and cyan, the hues used for process color printing inks. In papermaking, a calender stack, separate from the papermaking machine, with alternate metal and resilient rolls, used to produce a high finish on paper. The texture on the surface of the paper, such as smooth, matte, laid, cockle, linen, wove, etc. Roll edge alignment “runs out” starting at the core usually as the roll rotates. Paper with tight edges and a center area that is full and baggy. Shrunken edges will spring upward mostly. If severe enough, wrinkles will form in the center of the sheet during printing. A characteristic of paper, a slightly rough finish, which permits it to take ink readily. A printing ink which does not conceal the color beneath. Process inks are transparent so that they will blend to form other colors. A defect of any tear, cut or hole in the sheet which is folded over during slitting, winding, or printing. It is often at the edge of the roll. A thin, protective coating applied to a printed sheet for protection or appearance. Also, in inkmaking, it can be all or part of the ink vehicle. When Paper picks up moisture along the edges, the paper swells. But the center of the sheets do not change, causing the edges to pucker and acquire a wave. Wrinkling with an accordion appearance where several wrinkles are gathered in or folded immediately next to each other. This wrinkle may go all the way across the width of the roll or meander at an angle to the axis of the roll, often not visible from the roll edge. Usually localized near the core, and can be accompanied by core bursts. Creases at an angle to the machine direction resulting from the fold-over of a section of the eb. This puts a permanent crease into it.